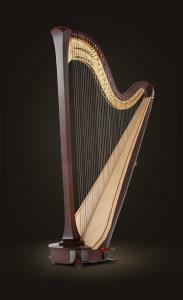 A modern harp created by Lyon & Healy in 1958, the Style 30 has a stately, formal look that endures the test of time. The sculpted vertical lines in the column are offset by soft arcs at the top. Angles in the base are restrained by a curved slope and bevelled edges. The soundboard with single inlay edging features two subtle angles, giving the illusion of a bend and complementing the graceful design of the column. The architectural shape of the harp creates a unique and brilliant sound. Image show a Style 30 in a Mahogany finish.